President Obama has been catching a lot of flack lately for taking his handy teleprompter wherever he goes. But it's really a modern conceit that only extemporaneous speaking is honest and real. As far as I can tell it's not much older than the authentic hippy days of the '60's. Of course politicians have always been expected to come up with snappy, off-the-cuff speeches "out on the stump." That's what Lincoln and Douglas were doing in their famous debates. But you'll notice that virtually nothing memorable came out of those debates other than a general respect for the brains of the candidates. For any important occasions though, they would read from a speech they'd labored long hours over. 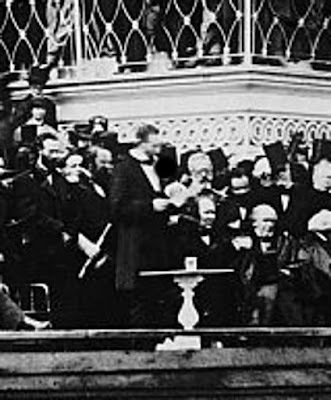 Once he became President Lincoln would outright refuse to give extemporaneous speeches; almost always he spoke even the most insignificant remarks only after he'd written them out. FDR, Kennedy, Reagan -- the truly memorable orators among our Presidents -- did the same. They also happened to be some of our best presidential writers. Giving your speech from a teleprompter, as President Obama does, is just the modern version of this ancient art. As Michael Gerson of the Washington Post puts it, "A teleprompter speech represents the elevation of writing in politics. And good writing has an authenticity of its own."